Armoire for Chatelaine Magazine, March 2012 issue. 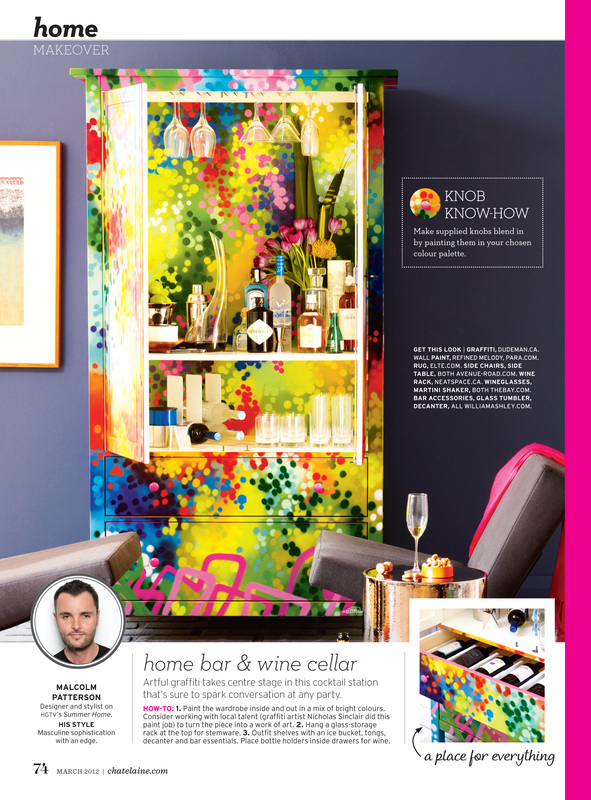 Armoire paint job commissioned by Malcolm Patterson (possibly one of my coolest clients) for a Chatelaine Magazine photo shoot, published in the March 2012 issue. I enjoy how the graphic work tends to hide the architectural elements of the actual structure. Spray paint and paint marker. March 2012 issue of Chatelaine Magazine. March 2012 issue of Chatelaine Magazine, page 74. Armoire paint job commissioned for a Chatelaine Magazine photoshoot, published in the March 2012 issue. Spray paint with a touch of paint marker. A friend asked me “Where are the Dudeman skulls going?” I told him that “this was not that type of client and that there is a time and a place” …however, by the time 3:30am rolled around -the paint markers started to fly. Open the door and it’s a bar inside! The finished piece, once all the elements were put into place, turned out to be an exceptionally well configured scenario. Open the drawer -this houses the wine bottles. Oh, did you spot the added detail of the hot pink drawer lip? Just delivered for the photo shoot. Beauty shot, setting the mood. Still back at my studio, prior to delivery.